Üsküdar University Journal of Social Sciences (ÜSBİD) is a well-known magazine that is being published twice a year in May and November in both Turkish and English. The purpose of Üsküdar University Journal of Social Sciences is to submit the original studies in the field of social sciences of Turkish and other researchers to readers. 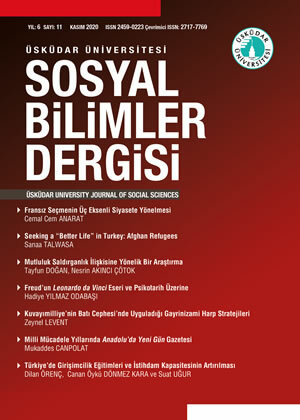 In the Uskudar University Journal of Social Sciences, articles from the areas of Political Science and International Relations, Economics and Administrative Sciences, History, Geography, Law, Security, Sociology, Psychology, Philosophy, Communication Sciences, Fine Arts, Linguistics, Turkish Language and Literature, Health and Educational Sciences are published. The opinions of the articles published in Üsküdar University Journal of Social Sciences belong to the author. The articles published in another magazine, book, and so on are not accepted. Notifications provided in national or international conferences, seminars and panels can be taken to the publication process after being specified in the footnote and converted into the article format. Published academic articles can only be reproduced for educational purposes. The articles, graphics and tables in articles other than educational purposes cannot be duplicated in part or in whole or archived without permission. Quotations may be made from the articles under the condition that they are indicated in the academic publications. It is assumed that the authors undertake that they will not claim royalties for the articles they have submitted for publication in Üsküdar University Journal of Social Sciences. 1. The Journal Editorial Board prepares the submitted articles before the referee procession. The articles that receive the “Referee process can begin” signal, approvals are sent to two experts national or international judgments in the field. 2. If both positive and negative responses are received from the referees, the article will then be sent to a third verdict. 3. If two rejections are given by the referees, the referee reports of “nonissuable judgment” is handed in to the author. 4. In case 'correction decision' is received from the referees, the articles together with the referee report are provided to the author and a maximum of 1 (one) month is allowed to make the necessary corrections. 5. The author must consider the criticism, evaluation and correction of the referee and the Editorial Board. 6. If needed, the revised article might be sent to the same referee and the article that received 'publishable report' from both referees, the Editorial Board shall take the list of “articles to be published” with the content of the journal based on the date of completion of the referee reports. 7. Publications submitted to the journal are not refunded whether they are published or not published. We invite you to send us article to publish on Üsküdar University Journal of Social Sciences (ISSN 2459 – 0223). Üsküdar University Journal of Social Sciences as a refereed journal has been publishing twice a year, on May and November both in Turkish and English. You may access to all of our issues via http://dergipark.gov.tr/uskudarsbd link or on Periodicals tab of Üsküdar University web site http://www.uskudar.edu.tr/tr/dergi/1/sosyal-bilimler-dergisi. Please subscribe your article using Start a New Submission button on the page below. You may need to create an account to be able to do this action if you don’t have any account on DergiPark.